A quilt hanging sleeve can be permanent or temporary and it can be sewn on after or at the same time you apply binding. A hanging sleeve allows a quilt to hang evenly, preventing the stretch that nearly always occurs when you secure the project to a wall with a series of pins or other fasteners. 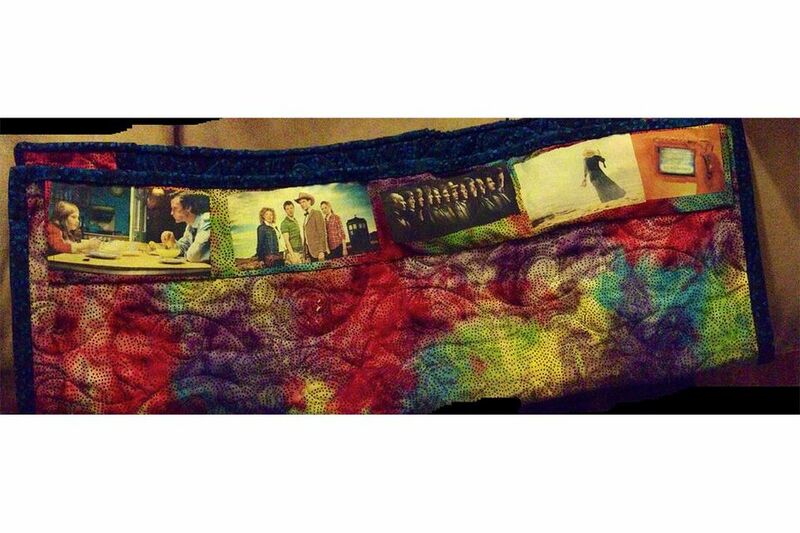 The photograph illustrates a hanging sleeve on the back of the TARDIS quilt. It includes media photos from Matt Smith's run as Doctor Who. The sleeve was sewn to the quilt when the binding was applied. Sandwich the quilt top, batting, and backing. Baste the layers together and then quilt or tie. Trim batting and backing carefully, squaring up corners as necessary. Cut or piece together fabric to make a strip 9" tall and the same width as the quilt. Fold under short edges 1/4", wrong sides together. Fold under again. Press. Sew a straight or zigzag seam to hem the folds. Fold the strip lengthwise, wrong sides together, aligning raw edges. Center the folded strip along the top edge of the quilt, against the backing, aligning its matched raw edges with the edge of the quilt. Sew the sleeve to the quilt with an approximate 1/8" seam allowance. Bind the quilt as you normally would. If you plan to use the tucked method to end double-fold binding, start binding on a side without the sleeve to help avoid bulk from extra layers of fabric. Finish the sleeve using Steps 6 through 8. You can use any fabric for the quilt sleeve, from plain muslin to something that enhances the reverse side of your quilt. Quilt shows usually require a 4" minimum sleeve. Read show rules before assembling the sleeve for your quilt. Use wide backing fabric to make a long sleeve without piecing strips of fabric. Use the same fabric you back the quilt with to make the sleeve blend with the backing. Refer to the illustrations as you make the quilt sleeve. Fold under both short edges about 1/4", wrong sides together. Fold under again to double the fabric. Press. Sew a straight or zigzag seam to hem the folds. Now fold the strip lengthwise, wrong sides together, aligning its raw edges. Sew together with a 1/2" seam allowance. Press the seam allowance open. Place the open seam against the quilt's back. Center and pin the top edge of the tube to the back of the quilt, about 1/2" below the binding. Use a whipstitch to sew the top edge of the tube to the quilt backing. Stitch into the quilt batting occasionally to help strengthen the seam but do not allow the stitches to show on the front of the quilt. Smooth the sleeve downward along the quilt backing and then make a 1/2" fold along its length to create a pleat. Leaving the pleat intact, pin the sleeve bottom to the quilt. Whipstitch the lower edge of the sleeve to the quilt. Remove pins. The sleeve will pooch out a bit to allow space for a hanging rod. Whipstitch the (short) back sides of the sleeve to the quilt. Leave the front sides unsewn to allow for rod insertion.